After such an interesting time in Melbourne yesterday afternoon and evening, it was fantastic to see 96 of the 102 entries in the 2011 UK-Halsey Boxing Day Dash make the start line. Unless you were in a different town for Christmas, you would have been hard pressed to miss that there was more water in the streets yesterday than in the Bay itself. Now that is more than a slight exaggeration, but the point is still valid. Swimming, not yachting was the idea. 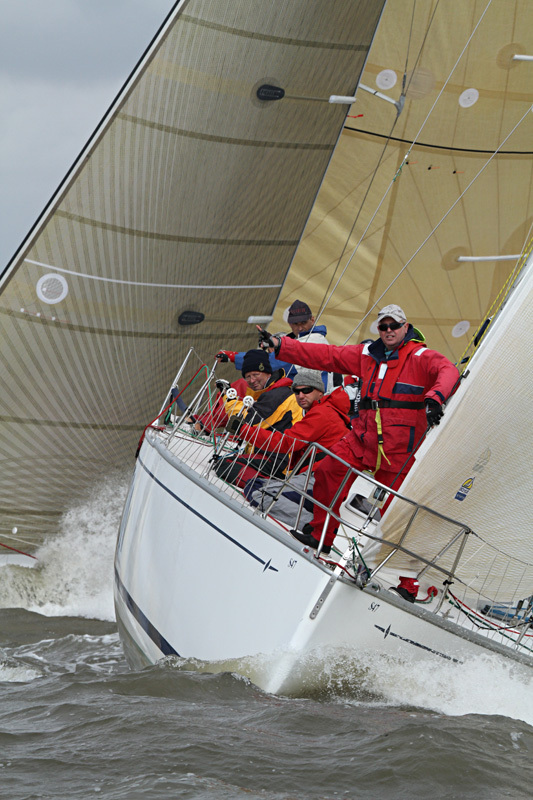 In 1976, the trophy was first awarded as part of the precursor to getting the fleet down to the bottom of Port Phillip, ready to be re-started the following day on the best suitable tide. 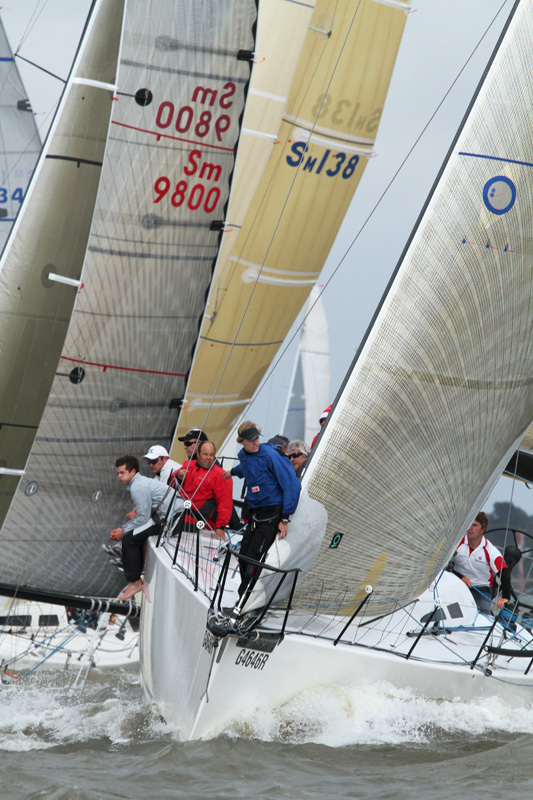 By 1979, the event had grown so popular that now just over half the fleet is not continuing on the next day in any of the ORCV’s Tassie Trio of races to the Apple Isle. The UK-Halsey Boxing Day Dash is the first race, from right around the entire country, to get away on December 26. 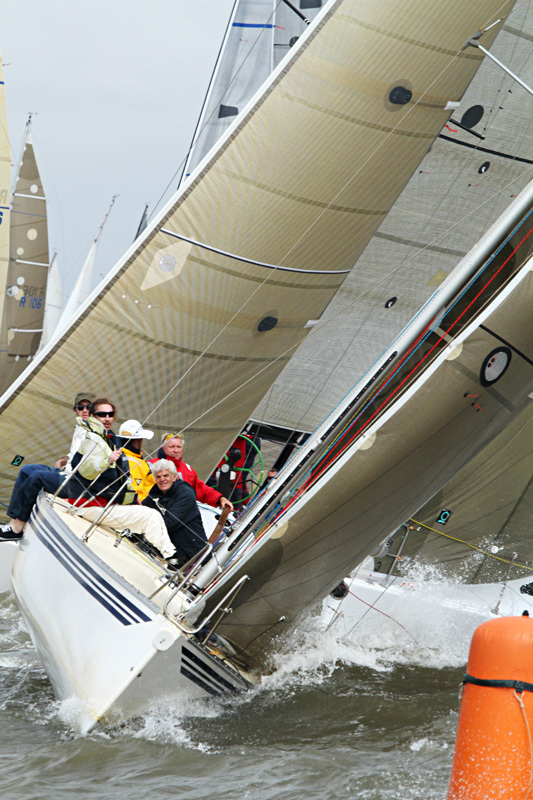 The attraction of an all-in fleet start gets the crews very motivated, however six were a little too exuberant and called On Course Side. Unfortunately, just the two of them returned, so the other four have had a bad day. PB Towage sent the firefighting tugboat, PB Plenty, out to add to the spectacle of the day and it very much worked. Speaking of spectacles, by the end, you would even need your sun variety, but more about all that later. A solid 18-knot Sou’souwester and a lumpy 1m sea greeted the fleet under a grey sky with the hint of sunny patches. Perhaps this is why the retirements started early and kept coming as the day wore on. In the end, seven vessels called it quits, but thankfully, damages were insignificant, which is always fantastic to not see. Interestingly, the breeze would climb in to mid-20’s as the day got sunnier. There are many stories inside an event like this. 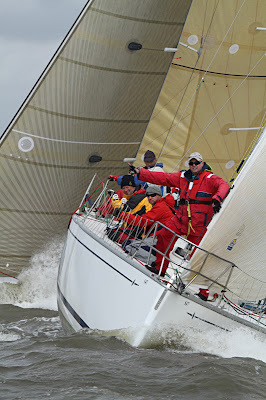 Watching three Beneteau First 40s finish within a couple of minutes of each other is great, as too were the crews hiking hard for the last part of the charge along the Mornington Peninsula. Equally, there was an armada of cruising type vessels allowing many types of sailors to partake in the event. “Great to see so many out, given the weather this morning, especially the cruising type boats. One of the main reasons we have got behind this terrific day long event, as UK-Halsey, is because it does draw out all manner of boats and styles of vessels, which is exactly whom we cater for as a premier sail maker, looking after the core of yachting right around Port Phillip.” said Sam Haines of UK-Halsey. Ultimately, Gusto won the 2011 UK-Halsey BDD arrived at 15:13:55, with Goldfinger next 15:28:18 and XLR8 in third at 15:40.30. A win is a win, but it is a bit of a shame for Gusto, who was just under four minutes short of her own record. Brian Pattinson, Gusto’s Skipper, said, “It was a good day. 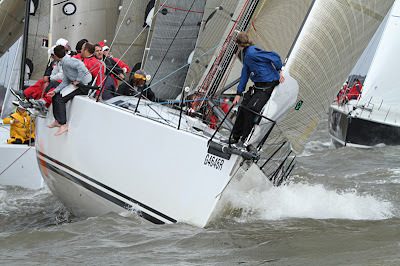 Certainly wet and windy, but with no breakages, we’re all set for tomorrow’s Eastcoaster down to Hobart. International Rule, Club (IRC) is the premier racing category and provisional results in Division One, have eXtasea take it from Bandit and Goldfinger. In Division Two, it was Mercedes III, from Stitched Up and White Noise. The Australian Measurement System (AMS) is ever growing in popularity and in Division One, the truly consistent Alibi took it from Bandit and eXtasea. Division Two in AMS was taken out by Avanti from Stitched Up and then Mercedes III. Finally, Veloce took out the Performance Handicap (PHS) Division One, which is great when you think they’re off to Hobart tomorrow. Alibi and Bandit, who are also going in the Heemskirk Eastcoaster to Hobart tomorrow, were second and third. One of the largest vessels out there and competing for the first time, Sympatico, won PHS Division Two. Déjà Vu was second. Third was Avanti, who collected some loot last year as well, so we think they’ll certainly be back for 2012, as too will be out great sponsor, UK-Halsey. The Cruising Division is another new category gaining great attention. Fantasy of Man took that from Ingara and then Adamant. “Great to see a pretty clean start, when it was such dark and gloomy day, backing up from the night’s tempest. We believe the measure of a successful event is seeing the number of smiles out on the water and at the destination port,” said ORCV Race Director, George Shaw.